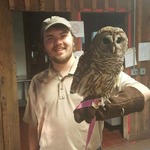 I am a student at East Tennessee State University in the Department of Biological Sciences. I enjoy spending time in the mountains of East Tennessee trout fishing, hiking, and herping. I am an avid salamander researcher. I believe they play a unique role in our environment and serve as indicator of its stability.